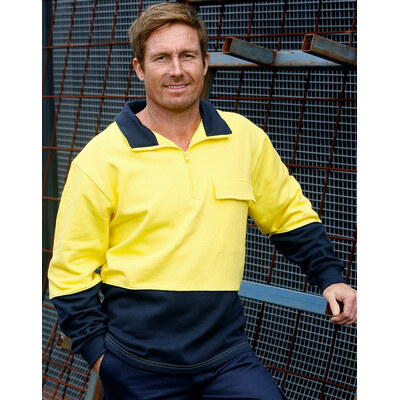 Hi-Vis Two Tone Cotton Fleecy Sweat300gsm - 100% Cotton. Conforms to ASNZS 4602.1:2011 Class D day use safety wear. Half front zipper. Colour: Fluoro OrangeNavy, Fluoro YellowNavy. Sizes: S - 3XL.